I have a Howard Fogg print and I can't find it anywhere on the internet. I was wondering if you could help me identify it. 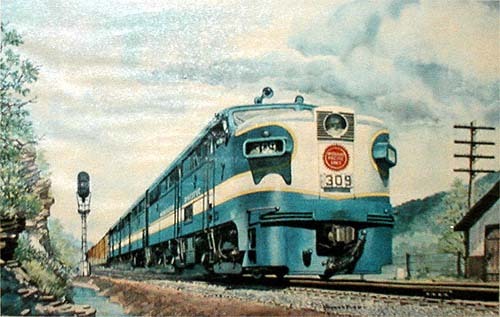 ... [the logo on the front of the locomotive reads] Missouri Pacific Lines. ... I appreciate any and all info such as date or name of the print. ... Thanks. ... I am looking for information on W.L. 'Nick of the Woods' Pritchard who is mentioned on one page of the CPRR.org website (see below). Comments attributed to [J].H. Strobridge state that track material, three locomotives etc. were hauled to Donner Lake. In an interview of R.L. Fulton with Mr. Strobridge, W.L. Pritchard is mentioned as the freighter who hauled the locomotives and perhaps also the other materials referred to in the above web page. Some similar comments about hauling locomotives and track on sleds was found at the Nevada Historical Society but the freighter's name was not mentioned. W.L. Pritchard is my wife's great grandfather and we are trying to find more information about his freighting activities as well as to use his business to put a face on wagon freighting in California and Nevada. Much information is available on railroads but we have found, subsequently confirmed with people at the Nevada Historical Society, that little has been written about organized freighting activities or stage coach operations during the development of California and Nevada. Are there any accounting records in the CP RR collection(s) that would allow the names of the freighters and their contribution to the building of the railroad to be identified/determined? J.M. Graham states that R.H. Pratt was in charge of obtaining all the wagons and teams from Cisco to ? (location marked out). Are there any records of the transactions of R.H. Pratt and, if so, do they perhaps include information on who provided the teams and wagons?